Here's the music that made the second half of Saturday's 50K the smiliest 15.5 miles I've ever run (except for the 30 minutes at the end when I was about to pass out). It's just over three hours of music, so you could use it for a half marathon or a full, depending on when you like to turn your music on. You know how some people like to wait it out for a few miles before turning to the glory of music. And I hug this playlist a million times over. Every single song made me want to sing my heart out to the trees and high five falling leaves. Also the loads of caffeine I ingested could have had something to do with that. And just an FYI, other than safety issues, I have no idea why people sometimes argue that music messes up your trail running chi. It's the exact opposite for me. The music makes me want to marry all the trees and have wood elf babies. Trail running with music: yes or no? If I'm running with people, no, but if I'm by myself, definitely yes. The 50K this weekend was the usual mix of love, hate, elation, and exhaustion, but I'll give you more on that later. The good news: I was finally over the persistent cough that was like the receipts that build up in my wallet. No matter how often I clean them out, new ones pop up to stake out wallet real estate. See picture below for most convincing sick faces you have ever seen in a photo. Party at my house with my sister and Nyquil shots. I'm pretty sure that autumn was the original cause of my sickness. I like to blame seasons because they can't defend themselves. Luckily, autumn is pretty, and I forgive it. Leaf party at Joy School. Along with the awesomeness of getting well before my last race of the year, my mailman brought me this little nugget of good race news too. And here are my Boston plans. Plan A: have fun. Plan B: buy all the souvenirs because I'm only doing this once (or at least once every three decades). Plan C: be thankful for the once-in-three-decades experience. For family night last week, our daughter led a little mini-lesson on thankfulness. 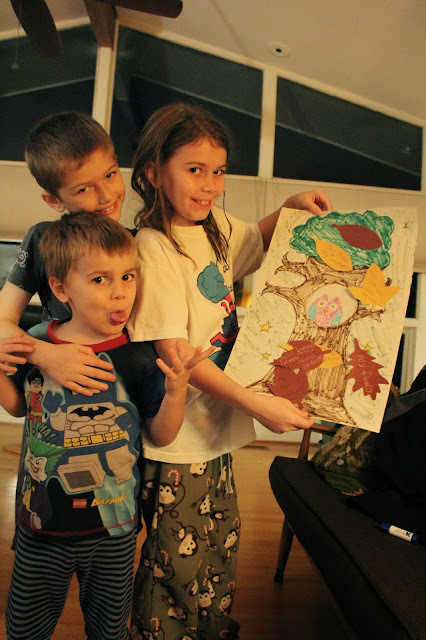 I'm thankful that she is so awesome and draws the best trees on the planet. And what else am I thankful for? For big brothers who volunteer to run all the way back to the child center when their little brothers forget their shoes and we didn't realize it until we got to the exit. 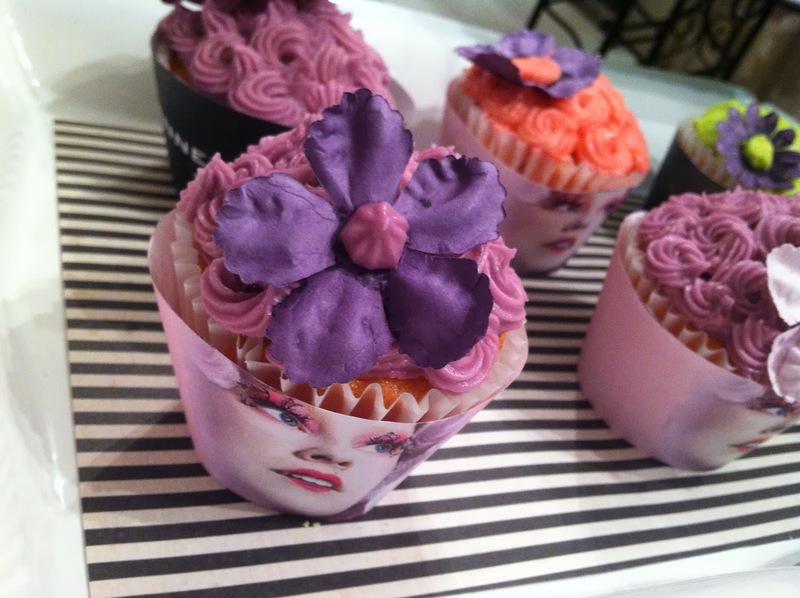 For movie premier parties with friends who are way more funny and creative than me. 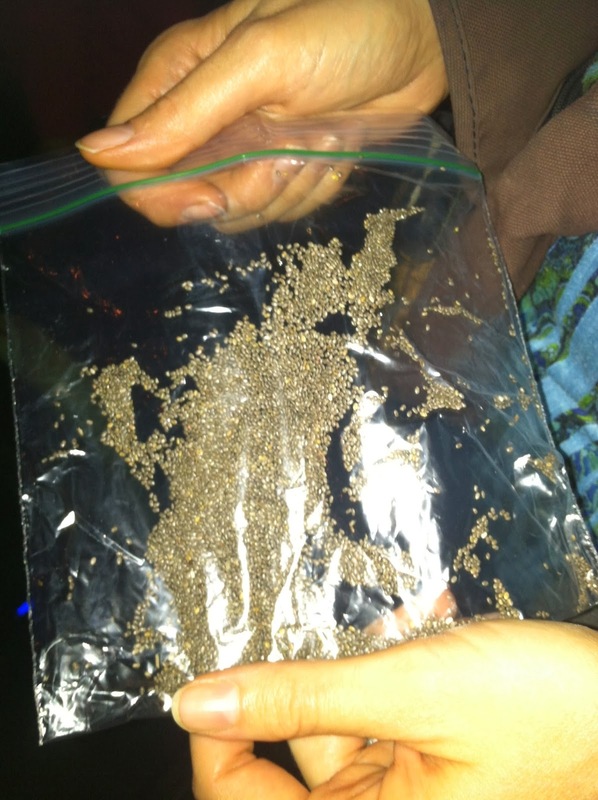 For friends who bring chia seeds to keep them awake at midnight showings of movies. 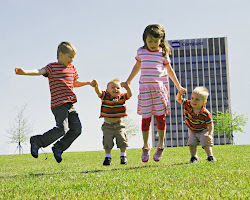 For unlimited train rides for kids at the McWane Science Center. That equals a lot of preschooler joy. What are you thankful for right this second? Did you watch Catching Fire yet? My race strategy for Saturday was just to run like Katniss does in the movie. For some reason, her run made me laugh every time. There is no way she runs like that in real life. Have you had any lingering illnesses this season? How did you get over it? I swear that mine finally went away when I stopped eating so much junk food to prep for my race last week. So could be just a coincidence, but whatever, I'm saying healthy food helped. Any races that you plan to just run once in your lifetime? I would definitely say that a 100 miler is on that list. So this is it. Tomorrow is my last big race of the year, the Tranquility Lake 50K. At the start of this year, anything longer than a marathon was just a pipe dream. The kind of thing you hope will happen, like making your bed every morning, but you're kind of sure it will remain undone. And now that this is the fourth 50K of the year, I guess adding trails and longer mileage into the running schedule is the new happy. I am shooting for a 50 miler sometime next year -- wish it could be Lake Martin, but that's too close to Boston. And then 2015 will be the year of the 100 miler. At least that's what I'm saying right now as I sit with my feet lazily propped up on an ottoman. Since the Savannah marathon, I've been taking it pretty easy on the running front. I've had a couple of fun Life Time runs. Highlighter colors for night runs. And I've been trying to get in some cross training, which is going to be a big focus after this weekend. I'm looking forward to switching the focus for at least a month or so before the big push for Boston training. 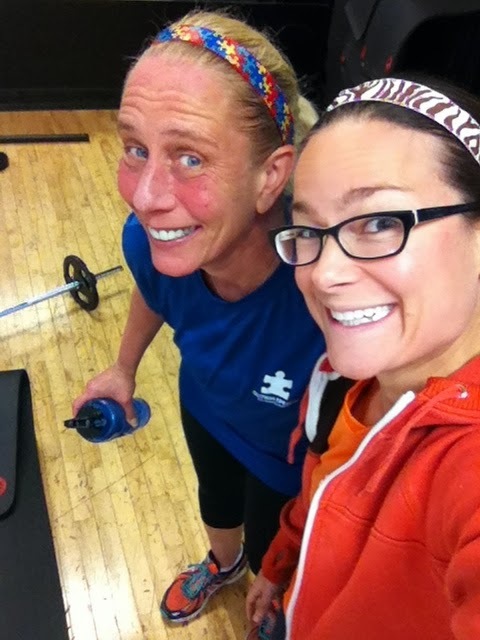 Body Pump with my homegirl Diane. Another running first this weekend, I'll be manning the Resolute Running water station for a road race at the Magic City Half this weekend. I'm getting out a costume (pictures will come!) that we found on the Halloween clearance rack, and I will be wearing my dancing feet. Hopefully I will also actually give some people water too. Are you in a running high or low right now? I'm excited to be going into a running low period. Although I have plans for ramping it up next year. Do you lift weights? How often? I'm hoping to start doing at least once a week, but lately I've just been doing yoga and my aqua bootcamp classes to build muscle. Any running related volunteer plans for the near future? 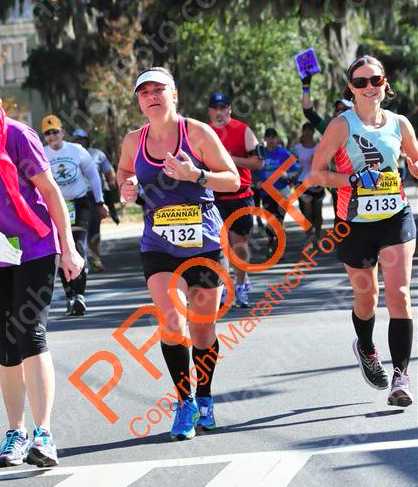 I can't believe I've waited this long to tell you the story of pacing the Savannah Marathon. But because of our recovering legs, I haven't even seen my pacee yet to remind her how amazing her performance was that day and rehash all of the details. What is almost as fun as running a marathon? Talking nonstop about that marathon you ran! Travel: Even though it was the weekend before Veteran's Day, the roads weren't too packed on our route. We left Birmingham around 8:30 a.m. and arrived in Savannah at 4:30 p.m. Hour time change and several million potty breaks in between. I wish my feet would get out of the way of my snacks. Expo: Every year we've been to this race, there has been something different (read: kind of messed up) about the expo. This year when we arrived, they were not allowing people to park close to the expo. They parked people in a field a couple of miles off and then sent them to the convention center via trolley. As we were passing the building, I made my husband pull over and drop me off to avoid wasting too much more time. We took the trolley back, and it added at least 30 minutes of waiting and riding time. So add an extra hour to your bib pickup time if that is still in effect next year. The line was all the way outside the building to pick up your bib, but it moved very quickly. I'm sure if you went the day before that the lines would be minimal or nonexistent. 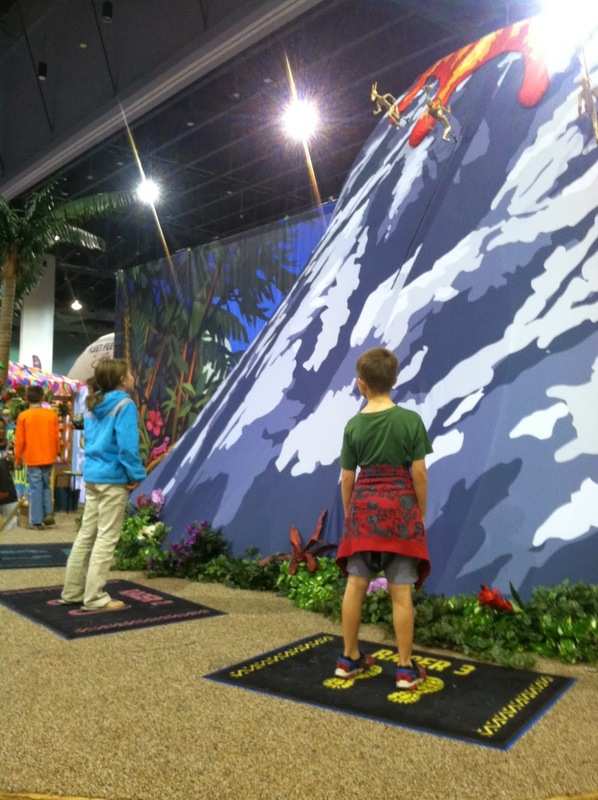 Brooks earned the usual win with my kids for having the most fun booths at the expo. We picked up a giant wad (thanks to my son) of Sport Bean samples and searched for the Swiftwick booth, hoping to get some socks on sale. Swiftwick wasn't there (boo! ), and the other sale racks didn't have anything I wanted in my size. So we were out of there pretty quickly, minus the waiting for the trolley ride. Photo bomber, Lara, Lisa (me), and Diane. Somehow Lara and I got numbers right next to each other even though we signed up at totally different times. Love the Brooks shirts, but the design was so-so. Swag bag and the few things inside (granola, window clings, and freeze gel). Race morning: I stayed with a friend who lives in Savannah, and her husband dropped us off about 30 minutes before the race start. Just in time to run (counting it as my warm-up) to meet my Oiselle teammates. Last year this race was held on the previous weekend, same weekend as New York Marathon. Because of the move to a week later, we were the first weekend after the time change, and there was a lot more light at the beginning of the race. Not good for when you have to skip the port-o-potty lines. I want to apologize to any business or resident who lives near the start line because with the crazy long lines for the port-o-potties, the world was our urinal. Road racing vs. trail racing: it feels much more taboo to drop your drawers in downtown Savannah than out in the woods. Somehow every year at Savannah, I face this dilemma of not having enough time to pee, but thankfully this year Lara gave me the courage to pee in a random alley by going first. Friends don't let friends wet their pants during a marathon. Or actually, friends don't judge friends who accidentally pee their pants during a marathon. My gear: Oiselle tank, black Oiselle roga shorts, black Swiftwick compression socks, my lucky Autism Speaks Sweaty Band, Hoka Bondi shoes. Course: So I think there were a few changes from last year, but honestly, I couldn't tell you what. In general the first half seemed to be exactly the same, and the finish was definitely in the same spot. We still ran through tons of tree canopied streets and by Savannah State (my favorite!) in the second half. There was still a Truman Parkway segment for a couple of miles on the way out and back, but it still was definitely not as long as the inaugural year. Our temps this year never reached 70, and we were in the 50s at the start. I think all of that combined with a nice shady course, kept us cool for the whole of the race. Truman Parkway is the only significant portion of the race without shade. This course is nice and flat, and if the temps were a little bit cooler, it would be the perfect place for Boston qualifying. 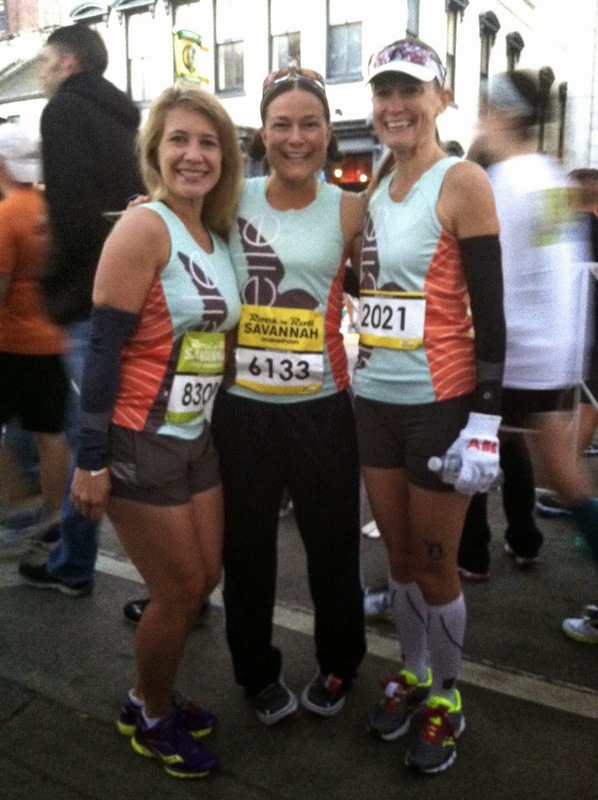 Our race: Always my favorite part of any race recap! We were under strict orders from Coach Alex to not go above 9:00 in the first three miles. Those first three miles in a marathon are so blissfully easy and adrenaline pumped, and you can't even comprehend the possibility of how crappy you will feel after 20 more miles of foot pounding. We were having to tell ourselves over and over to slow down and run so easy that it almost made our hearts burst out of our chest with a desire to run faster. But I am happy to say that we reached that goal, mostly. The third mile was in the 8:50s, but close enough to make us feel smug about our accomplishment. World's best 4-hour marathon pacer (Jenn in the green shirt) in action! Our orders from coach after that were to stick with anything under 9-minute miles, and my unspoken rule was to not let us drift under 8:30. We held a pretty solid 8:35 for the middle 15 miles. We were shooting for at least a 3:55 finish, but we would definitely take anything faster. And Lara only needs a 3:45 to qualify for Boston, so of course, it was so tempting to rally for that too. 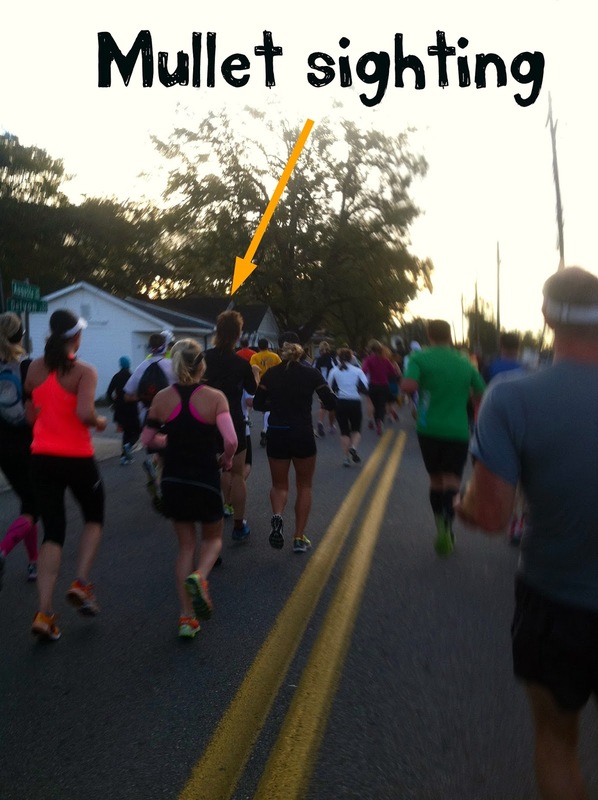 With a crowded course, there were lots of distractions, like the guy with the mullet in the pic below. I have a hard time telling the difference between an organic mullet and an ironic one. But I'm voting that this was an ironic one. And I'm so happy that they didn't mess with the Savannah State portion of the race. It is the best! If you are from Savannah State and reading this (not likely), thank you so much for all of those high fives. They made us run faster. Literally, I could feel our pace lagging, and every high five sped us up. So going into this race, I wasn't expecting Lara to push the pace as much as she did, and honestly, I don't know if I was mentally ready for the challenge she was about to bring. She was not going to idle through this race. When she started, she was set to push to the finish. I let her set the pace for most of the race because I didn't want her to feel like she was trying to catch up to something (that is how I feel when people run ahead of me when they are pacing me). I wonder how this works for most people because I'm sure some people hate to lead too. I'll have to check with Lara on what her preference is (really helpful to do now that the race is over). She already had her game plan down for the water stops too. We ran through them from the start, and she and I both took gels at about miles 5, 10, 15, 20, and 23. We also both alternated water and Gatorade. I had all GUs because that's what was available on the course, and I could tell that my stomach did not fully appreciate those. There was some churning going on every time I took one, but it's very smart to train with GU (or have your own brand on hand) if you are running a Rock n' Roll series race because that's what they provide for you. Unfortunately, although we both charged our watches for a full night before the race, we both had dead Garmins by mile 18. In some ways, I think it worked out for the better (but I'm still mad atcha, Garmin!). Lara just knew that she had to keep pushing as hard as she could, and I was forced to relax my overzealous watch hawking. Because she was pushing the pace so hard, I wasn't the best running companion because I was TIRED. Tip: don't let your pacee outrun you. We were both pretty quiet after the halfway point, but I was really proud of Lara for holding out on putting her headphones in until about mile 20. I personally would have used them much earlier! Hey, where is that kid's bib? When we hit the parkway on the way back, Lara's stomach started to cramp, and we needed a quick walk break. With about three miles to go, I knew that she could still reach all of her goals if we just truncated the walk breaks. So that's what we did. We'd pick out the cone we were going to walk to, and we kept it short before picking back up again. Those last few miles were really the only time that I felt like I was able to help her at all because the rest of the time she was pushing me! I wanted to stop running after mile 20, but I tried to keep that info to myself because I didn't want to psych her out. Also, Lara said that she had to have her rap music to swear at her at the end of the race. Swearing can be super motivational, right?! If you know me in real life, you know that I'm not the biggest swearer, but I promised her that I would drop some swear bombs if she needed it at the end. Anything for a friend. Except when I tried it during our walk breaks in that final stretch of the race, it just sounded like Justin Bieber trying to gangsta rap, and instead of pushing her to finish strong, it just made her pee her pants a little more. That final 1.5-mile stretch was my favorite. Lara was pushing so hard, and I knew she was going to reach her goal if she just kept moving forward. When she finally looked up and saw the finish chute, she took off like a gazelle, and I honestly could not catch up with her. Despite any struggle in the last few miles, her kick was on target! The 3:50 pacer hot on our trail. Although she was so oxygen deprived that she did almost go down the 13.1 chute instead of the 26.2 chute (at the finish, the two distances are divided at the end by metal fencing so you can't cross over). Because I couldn't catch up with her, I was just yelling from behind, "Wrong side. It's on the left!" Plus she was also fooled by the false finish line like I was last year. I'm still mad when I think about that, BTW. Flashback: I missed qualifying for Boston by two seconds at this race last year. So she started walking where it was painted to look like a finish line, which was the point that I caught up to her to tell her that we weren't done yet, just a few more steps to the actual finish. Savannah, please take out that fake finish line! She totally demolished her original goal by finishing in 3:49. I was so proud of how hard she worked out there. I love to see different people's racing styles, and Lara's style is definitely push-push-push. When she saw someone in front of her, she was not content to follow them; she pushed past them every time. My prediction is that she will easily (by that I mean with a lot of hard work) have her 3:45 for Boston in the near future. There are no easy marathons. It doesn't matter if you are running faster or slower than you have run before, you still get to that point where you have to convince yourself to keep pushing to the finish line. I wanted to complain a lot about sore legs and side stitches during this race, but I just held it (mostly) in so that I didn't plant seeds of doubt in Lara's mind. She pushed me way harder than I would have pushed myself that day, and I'm grateful that I got to witness her marathon grit. Me and J-Lo at the finish. 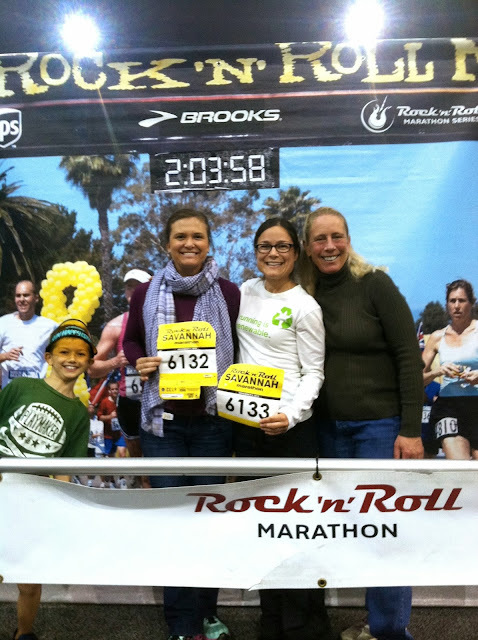 After getting ice and Tylenol from the medical tent, we went back to cheer our friend Diane on to her strong finish. Look at that kick down the finish chute. Special thanks to Amory, Greg (Diane's husband), and the kidlets, who were at different spots along the course cheering us on. Amory and me with the boys. Free hugs for marathon finishers. Greg was smart and brought his bike to find Diane on the course. Who needs a band at the finish line when you've got this act? And the last special thanks goes to the best gym buddies I could ask for. They are hard working ladies who are so devoted to their families. I love them both so much! I might have quit this running business a while back if it wasn't for friends like them who inspire me to get moving every day. One pack was hanging on my right shoulder to house my warm clothes when I shed them at the aid station, and another pack with extra shoes, socks, and food for my runner was hanging on my left. Squarely in-between, my Camelbak was already filled and strapped on tight. It was 3 a.m., and my family was all still snoozing somewhat soundly in their tents in the middle of our primitive campsite a half mile from the Bull's Gap aid station, the 85-mile mark at the Pinhoti 100. I snuck off as quietly as I could to hop on the trail and join the quiet shuffle of runners making their way through the dark to the aid station. I looked a lot different from them because I was bundled up in a puffy jacket, I had been sleeping, and my legs didn't feel like someone had been trying to rip them off for the previous 21 hours. The runners started at 6 a.m. the day before to travel 100 miles through Alabama's Talladega National Forest. We heard the first runners start slipping past our campsite (mile 84.5) at 9 p.m. My runner was due into the aid station anywhere between 3:30 a.m. and 7:30 a.m. As I descended into the aid station a group of about twenty people huddled together around a fire were cheering for me. 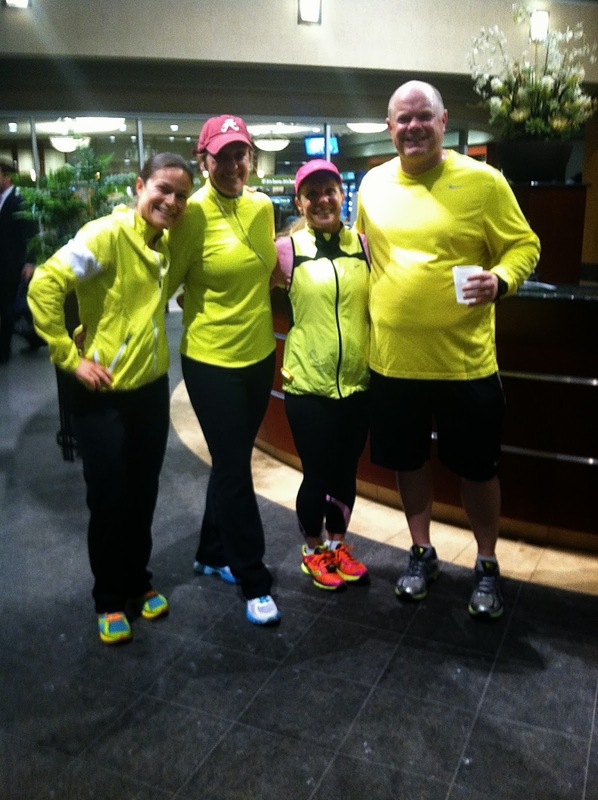 I mumbled sleepily to them that I wasn't a runner, but they kind of made me wish that I was. Once I made sure that my runner hadn't already passed through the aid station (my biggest fear of pacing), I settled into warming my legs by the campfire and searching the woods for unoccupied "toilets." While sitting by the fire, I spent a lot of time being fascinated by the ritual of the aid station. Runners would come into the aid station and people (maybe their crew, maybe the aid station workers) would immediately surround them and start performing the rituals of feeding them, changing their shoes, powdering/vaselining their feet. And it all happened with minimal talking, the evidence of experience from the previous 85 miles. I was also trying to watch out for Jeremy's crew chief (a person who coordinates your care, pacing, supplies for the 100 miles), Greg, to get an idea of what kind of shape Jeremy was in. At some point (time was foggy), I heard someone talking right behind me and realized that it was Greg, and there is no telling how long he had been standing right beside me in the dark before I recognized him. 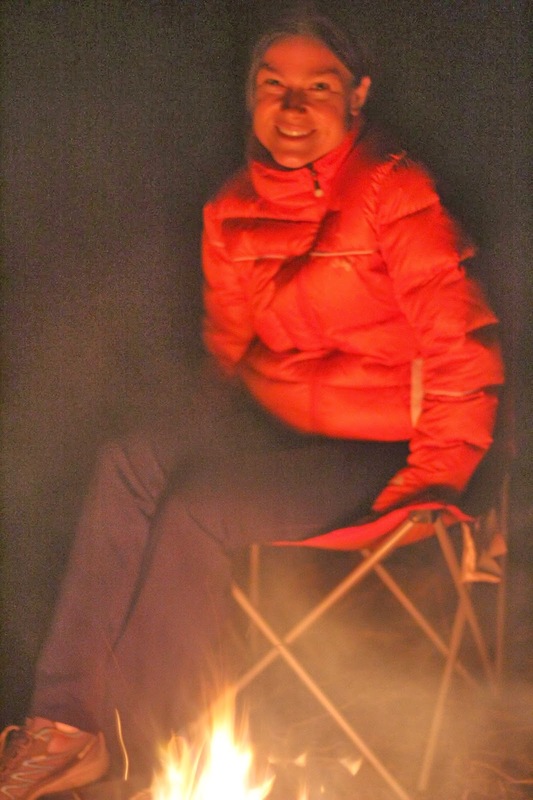 Warming up by the fire or catching on fire. He already had a collection of stories to tell me about the previous 24 hours of trail madness. Some turned out well, like the doctor who just happened to be waiting to pace someone 500 feet from a racer who started to have seizures and the guy who just happened to have a car jack to loan out when our crew locked their keys in the car in the middle of the night. There were also lots of sad stories about trail warriors who had already been forced to give up the 100-mile fight. As we talked about each one, I felt like the final players in Survivor who have to walk by each name of the ousted players in the game and remember something about them. And of course he gave me an update on Jeremy, who I fully expected to be in 100% zombie mode by the time he arrived at mile 85. He would already have been awake and running for for more than 24 hours by the time he would meet me, way past the point of requiring a nap. Shortly after I found Greg, Jeremy popped over the hill and ran, not hobbled, down the hill into the aid station. He sat down in a camping chair, and I kneeled down beside him to follow the ritual that I had seen performed dozens of times while I waited. I was surprised to be able to carry on an actual conversation with Jeremy. Feeling sure it was a fluke, I focused on helping him get his necessary fuel (hot soup, Coke, and an energy drink) and shoe change. I pulled Micheal, who had just paced Jeremy for the previous 40+ miles, aside to get the real scoop. Michael had been doing an amazing job of pushing Jeremy forward through the night, forcing him to cut short his time at the aid stations. My favorite story, heard from both Jeremy's and Michael's perspectives, was that Jeremy was trying to get a cup of boiled potatoes at an aid station, and Michael, who had already warned Jeremy to hurry up, just took off without him. No time wasting! So Jeremy grabbed his cup o' potatoes and attempted to scarf them down on the run. Running plus eating boiled potatoes equaled upchucked potatoes. I figure that half the things I heard were made up or hallucinated in some way, but for some reason, I can't get enough of running vomit stories. But, for real yo, pushing through the aid stations is a perfect strategy. 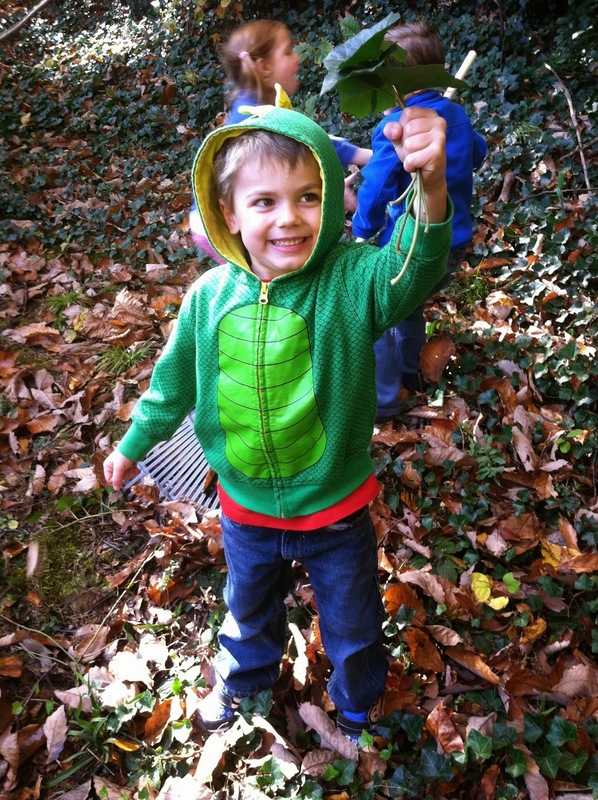 Michael is usually a super laid back kind of person, but he's also good at trail math. If you spend 10 minutes per aid station at Pinhoti, you'll have tacked on three hours by the end. Probably at some point (specifically at Pinnacle, the most welcoming aid station because it was run by our hometown BUTS crew) Jeremy was annoyed that he was getting pushed through the aid stations, but by the time he got to me, he was all business. He even left me at the last aid station, and I had to quit stuffing my face with brownies (a running first for me, but the volunteers kept swearing that they were amazing) to catch up. So instead of a zombie runner, I got a super intense version of Jeremy. The closer he got to the finish, the more determined he got. I would say that in normal trail running and racing life, Jeremy is relatively laid back (from my perspective anyway). We're all a little competitive when it comes to racing, but you know how some people are just really intense about it. Jeremy is typically chill on race days, and he spouts off minimal trash talk. Because he had taken it easy at the beginning of the race (i.e. a very smart strategy when running 100 miles), his legs still felt great when he got to me, so we were even running up some of the hills, which we would usually use for a hike break. There were a lot of people hiking and in survival mode at the end of this race, and every time we passed someone, I swear that it made Jeremy run faster. So much so that at the end of the race, when we popped out on a couple of miles of pavement on the way to the finish line, I looked down at my Garmin and saw 9:? ?s and 8:? ?s for our mile averages. 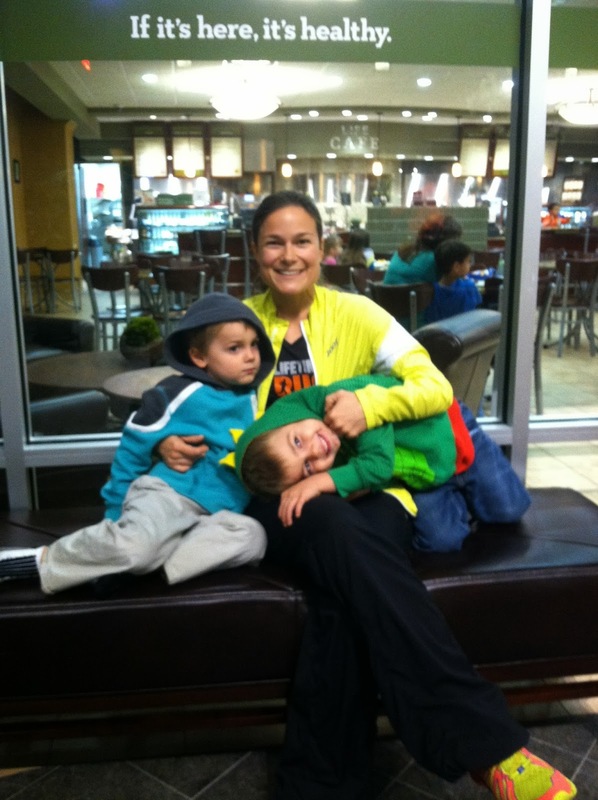 What the heck -- who does that at the end of running 100 miles? The fall leaves made me love this finish. I also expected Jeremy to be incoherent and possibly hallucinating, which is a typical side effect of running for over 24 hours. Although he did go heavy into calculations, meaning he was calculating end times over and over and over again, he was able to correctly add numbers. I personally found that impressive, because I can't figure out 1 + 1 with race brain. As far as I know, he didn't hallucinate at all, and he kept talking and laughing right on to the end of the race. Pretty much everything I expected to find was the opposite. Instead of a zombified, incoherent, hobbling runner, I got an energetic, saucy, competitive runner. There were a couple of points, like when he was sprinting up hills, that I wondered if I was actually going to be able to keep up with him for the final 15 miles. I didn't look at his final times, but if he didn't run those last 15 faster than any other segment in his race, I would be surprised. His final time was 27:26. That's 27 hours not minutes, y'all. Just amazing. Running all night into the sunrise. 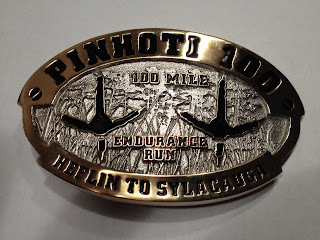 Observations about this specific race: Pinhoti is a point-to-point 100 miler and includes some pretty tough, hilly running during the night portion. There are also some water crossing that can be rough if your feet are sensitive to running while wet. I saw a lot of pics of gnarly blisters after this race, but my runner made it through fine with some toe socks. From what I heard, he changed socks at least once, and I helped him change shoes at mile 85 (he probably that before as well). Plus they took their time to pick their way through the water so as not to get too wet. The final 15 miles are pretty runnable on fire roads and some easier trails. The aid stations that I saw were well stocked, except one had run out of coke. I think that is illegal during a 100 miler. Also it should be illegal to run out of belt buckles at the finish. When we (by that I mean Jeremy who actually ran 100 miles) busted our butts to haul it into the finish, the no belt buckle part was extremely anticlimactic. Word is that they ran out. He was finisher 95 of 164. I'm not sure when they ran out, but even if he was the first one to not receive one, that is a lot of anticlimactic finishes. Also there was no food at the finish. Maybe this is normal for 100 milers? Like not even a bag of chips. I think they had some water bottles somewhere. I'm not sure if all 100 milers end like that, but it felt kind of sad after all that work. Does anyone know if that's normal? Edit: Someone just let me know that there was food across the street at the parks and rec building. So if you finish and don't see any, ask for directions. Thanks for the tip, Jennifer! Do I want to run 100 miles straight? Of course! Before this, I definitely thought this was not on my list of goals, but honestly, it just looked so fun. And my friend Danny Haralson promised to crew for me if I do! Ok, so he vaguely mentioned that in passing, but now that it is on the internet with an exclamation point, it is true. I have decided that it is important to pick the 100 miler that is close to home and has the best belt buckle. Since this is a new race for 2014, there is no official belt buckle picture yet, but the scoop is that it will be based on this photo. I love a good lighthouse. And the race directors for this one are my favorite people on the planet earth. But my real favorite belt buckle is from the Zion 100, where they use materials from the course to make a different buckle for all the finishers. I freaking love it. But it's so far away that it would probably be impossible. Which race would you choose? And don't try to bring up race logistics or anything relevant! All voting is based strictly on coolness of the belt buckle. Do you have any desire in your heart to run a 100 miler? I seriously hope my husband does not read that part about how I think this sounds like a really fun idea. 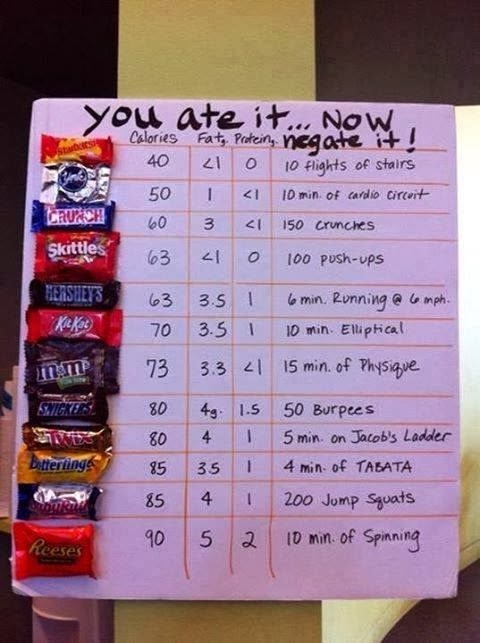 If you refrained from eating Halloween candy, I'll give you $100. No, not really, but I will be extremely impressed. I thought this would be my year to resist the chocolatey temptations, but I caved the day before and kept the sugar fest going through Halloween night. I paid the price too with two solid days of mood swings and low energy. Does that happen to you too when you eat too much candy? If you're just looking to work off what you ate, check out this chart that my friend shared. Looks like I'll be doing about 1,000 minutes of elliptical. And what is Physique? I'm going to guess that it was probably developed in California. Isn't that where all new exercises are developed? No one ever blames Alabama for starting a new exercise or healthy eating craze. Dang it! Every time I eat a bunch of candy I start chugging water to help wash it out. I don't even know if that is effective at all, but I tend to not drink enough water regularly anyway. So it's a win wither way. There are also the few days after the candy-go-crazy day that I am battling cravings. 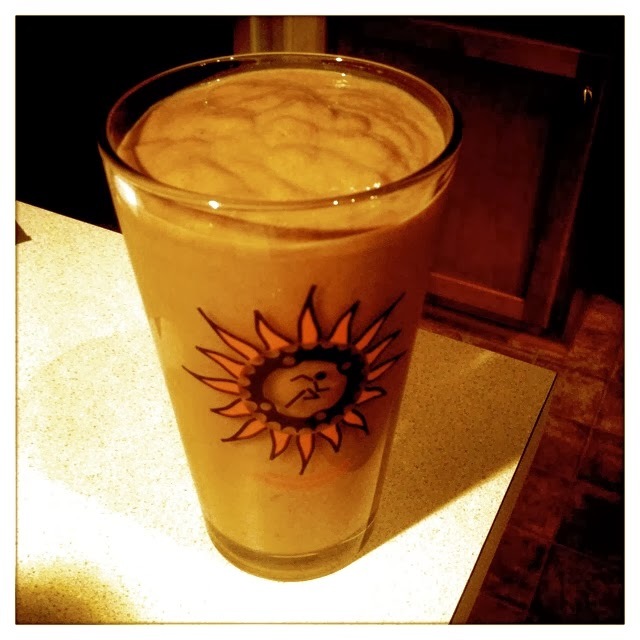 This creamy chocolate avocado smoothie helped me bridge the gap back to eating slightly healthier this time around. The recipe is from Against All Grain. I liked this one because the ingredients were so simple, and we had all of it on hand already. Except for almond butter, so I used cashew butter instead. Oh, and it tasted pretty descent. I mean it's no Reese's Peanut Butter Cup, but it also won't make you feel (and/or look) like you got punched in the face when you wake up the next morning. Am I the only one who gets really swollen eyes the next morning when I eat sweets? How crazy did you go with Halloween candy this year? Are you still going? The leftover candy is definitely taunting me from the highest shelf I could find to stash it on. I should just get rid of it, but I can't bring myself to throw "food" away. What do you do to recover from Halloween? Do you feel like you have to eat or work out differently during this time of year? It's so hard for me to stay on a healthy eating track from October 31st until New Year's, and I probably exercise less. So, yes, I am more lazy all around. Note: when this posts, I'll be out pacing my friend to 100 miles. Send all the good thoughts you can muster our way!